Size of this preview: 415 × 599 pixels. Other resolutions: 166 × 240 pixels | 540 × 779 pixels. 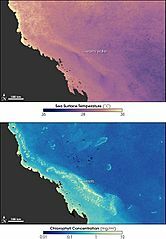 Description: Two images showing the relationship of water temperature to coral bleaching along the Great Barrier Reef. 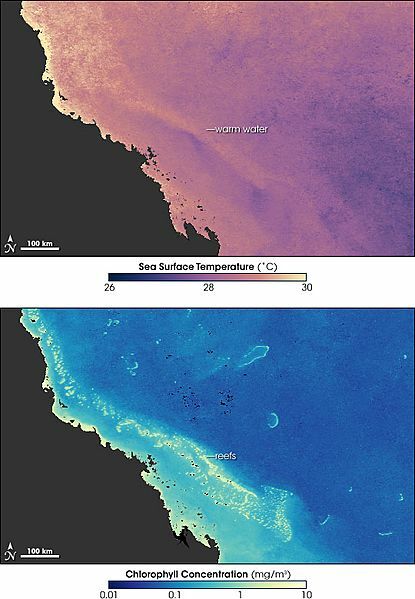 Warm pink and yellow tones show where sea surface temperatures were warm in the top image. The warmest waters are the shallow waters over the reef near the coast, where coral bleaching was most severe in the summer. The lower image shows chlorophyll concentrations, where high concentrations (yellow) generally point to a high concentration of phytoplankton in surface waters of the ocean. In this image, the bright yellow dots actually represent the coral reefs, and not surface phytoplankton.